Well, I had hoped to show pics of a new roller bridge on my Wildkat, but the one I ordered (a mid-price one thru Amazon) arrived this morning and it's absolute junk. It looks pretty enough, but it's so poorly constructed that it's unusable. The saddles are too small for the housing and pivot on the adjustment screws- literally rocking from side to side. The slot on the rollers is WAY too wide- even for the low E string. Worse yet, the rollers are held in the saddles by tiny shafts that 1) are too long and stick out from the sides of the saddles (preventing the saddles from sliding past each other when adjusting intonation) and 2) not held in by anything so they simply fall out and disappear into the carpet the instant you tip the guitar into playing position! Guess that's what I get for being cheap. sorry to hear your having bad luck with your new roller bridge. what type did you order? 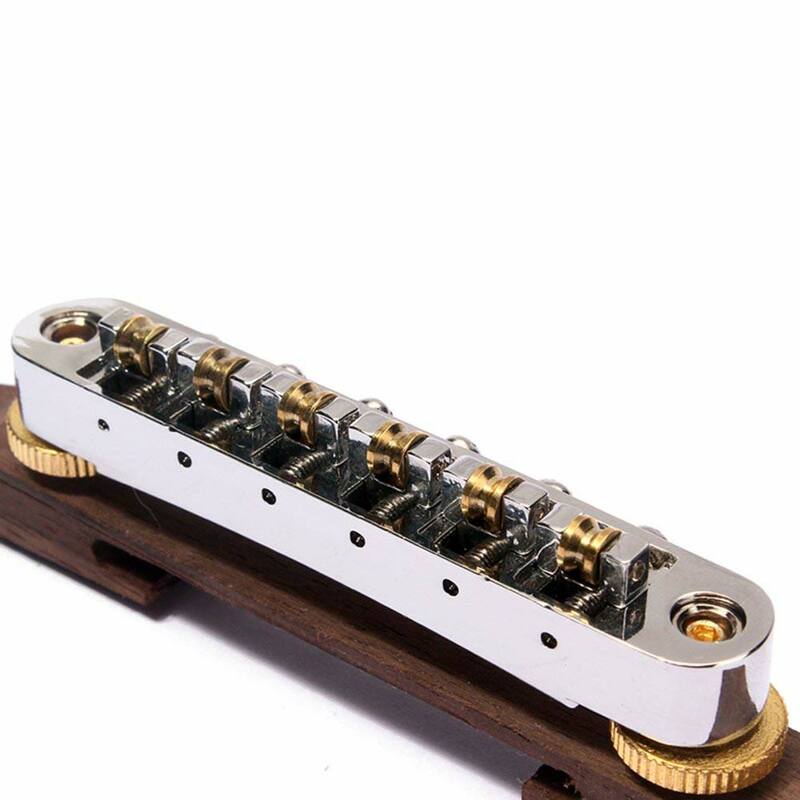 I just ordered another one of these T-O-M roller bridges from Philadelphia Luthier Tools on eBay for $14.95 + shipping, I have had good luck with them.. It was this one, sold on Amazon for archtops. Doesn't your Wildkat use mounting posts? The one I linked should fit your WildKat with out mods. It did, but I like to experiment and modify things. I removed the stock Wildkat inserts & posts and shaved the new bridge's rosewood base down to about half the height shown in the picture so the new bridge itself sits at the same height as the original. Because the wooden base is wider, the bridge now touches the top of the guitar over both the solid block and some of the hollow areas as well, giving it a slightly more acoustic sound. sorry didn't mean to jump the gun.. its a nice looking bridge and interesting experiment.. let us know how it comes out.. 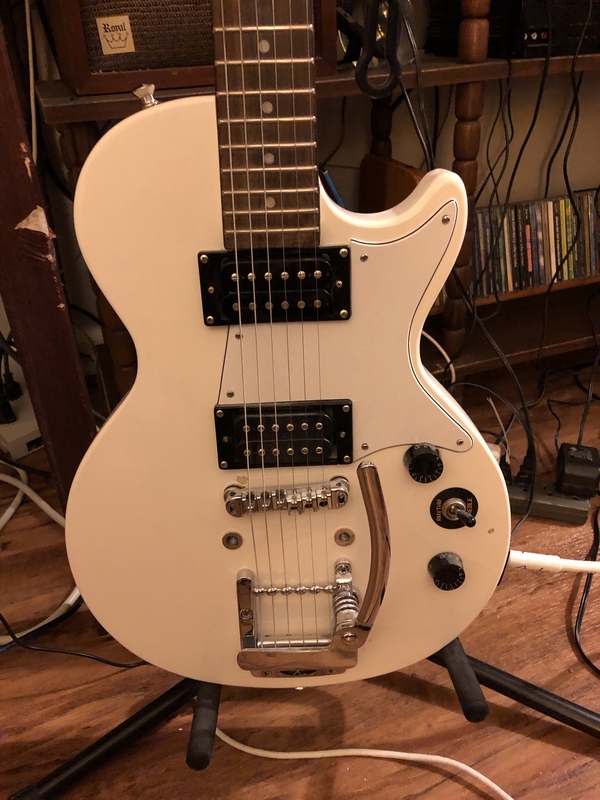 I acquired a nice used cherry G400 and installed some humbucker sized GFS P-90's (similar to P94's), a T-O-M roller bridge and a Duesenberg Les Trem II. I have been playing it a lot lately.. For me, a very nice combination of mods. This is my 3rd Les Trem II, they are so easy to install, just replacing the stop bar and it can dive almost as much as a Strat.. 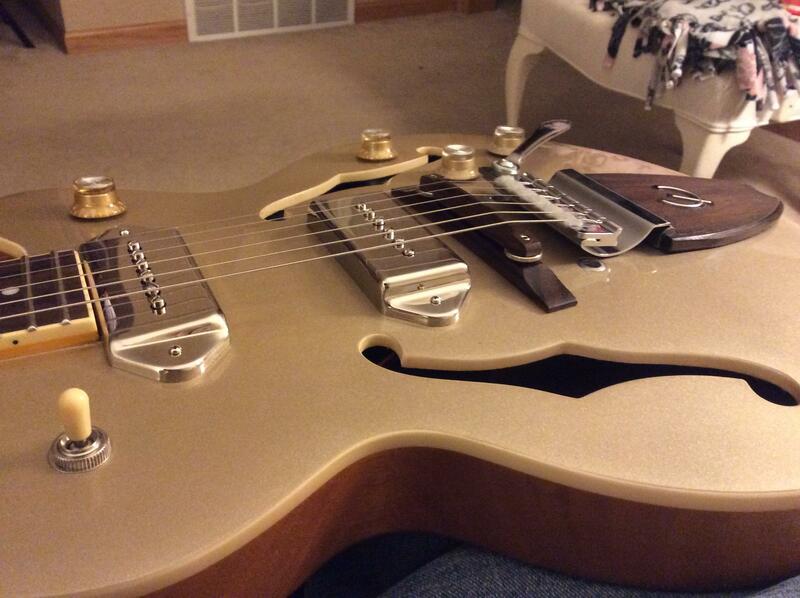 Interesting positioning on the Bigsby style tremolo's in addition to using a T-O-M roller bridge and T-O-M locking roller bridge. Still having a lot fun playing the G400, it is so much lighter than my back killing 10lb Les Paul Standard Pro, that is also a dream to play... 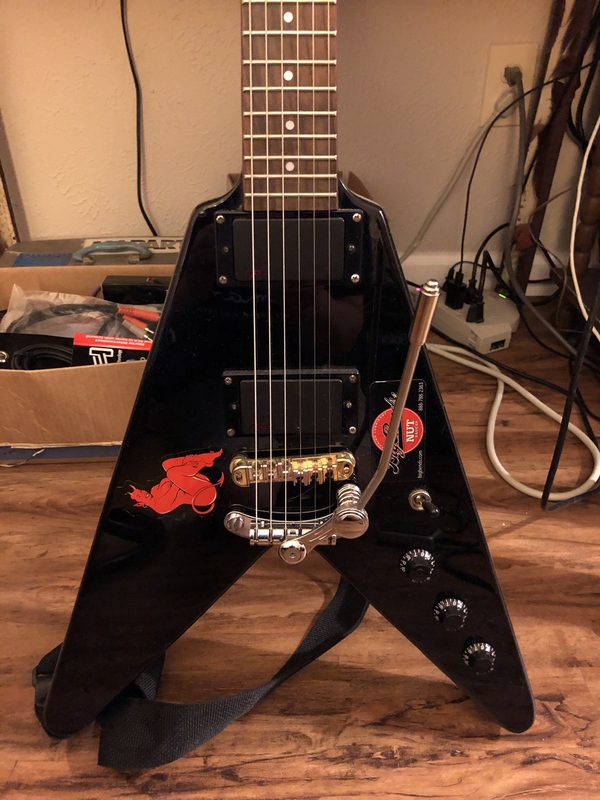 Looking forward to my next project ..
My left hand tremolo experiment using a locking T-O-M bridge with new mods adding GFS Dream 90's and a Towner Down Tension Bar. My stock Stop Bar 8mm Asian stud necks had to be reduced in size for the Towner Down Tension Bar to fit as it is sized for Gibson studs that have 1/4" necks. 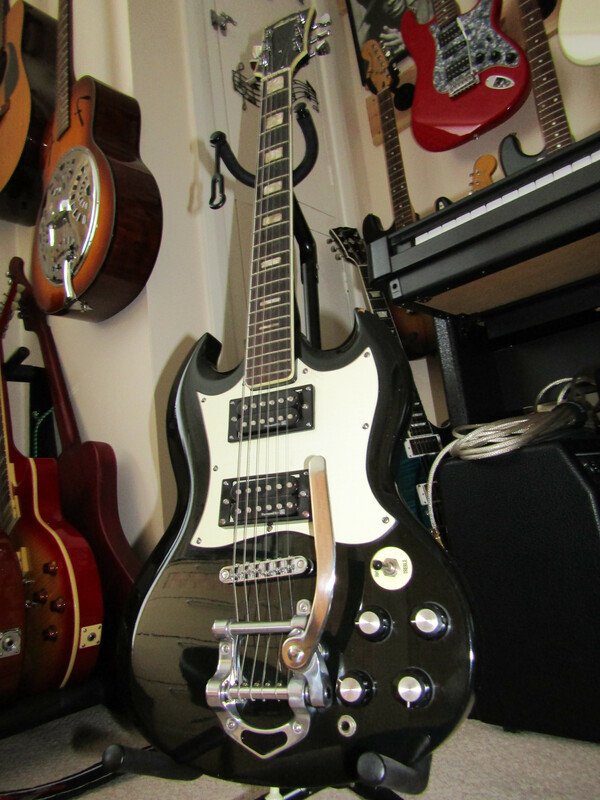 Installed a Stetsbar tremolo to replace my wraparound bridge on 61 SG.. works pretty good.. I have always considered the way a Strat tremolo functions to be superior as strings are not dragged over the bridge, because the bridge and tremolo are one piece and move together with the intonation position getting very little movement. The main problem with the Strat style is the size of the cutout required to install one in another guitar. 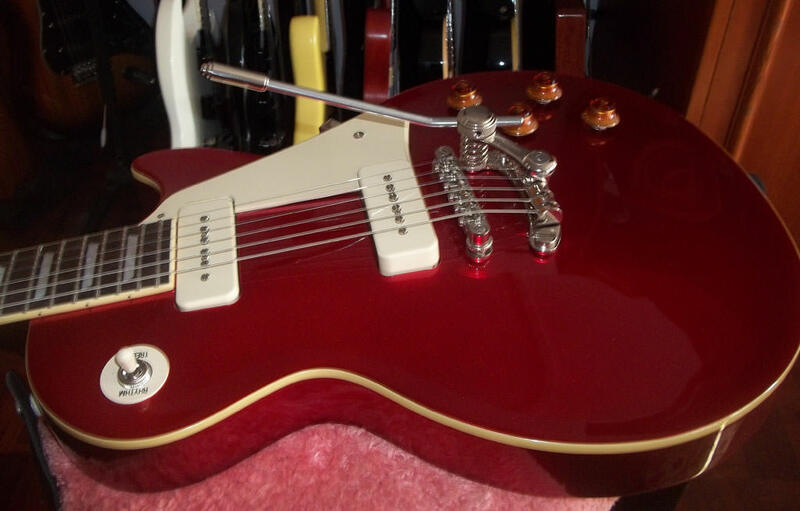 Finding a surface mount (non intrusive) tremolo for Gibson style guitars that give as much range of travel can be difficult. 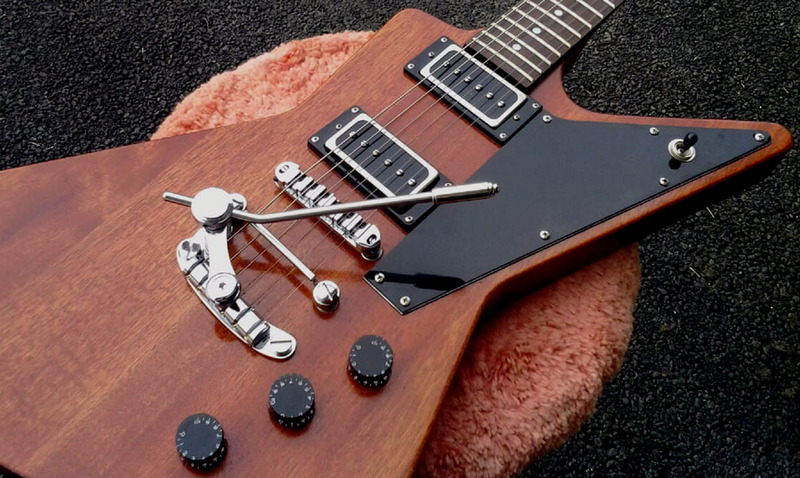 Bigsby and Les Trem's first require the strings not to stick on the nut, then sliding over the bridge can be a problem when returning to zero or tune position where roller bridges help out quite a bit. 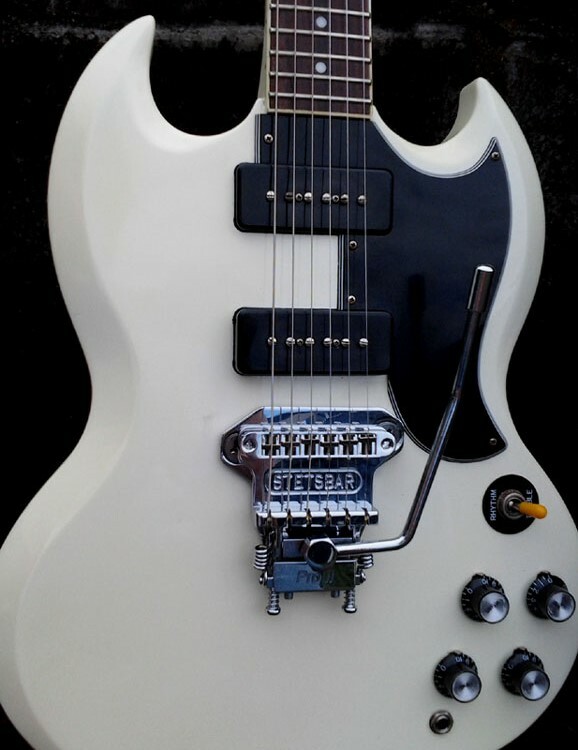 The Stetsbar style moves the bridge and sting stop as one piece and can easily come back to zero very accurately, similar to the Floyd Rose for Gibson style guitars. The main drawback is cost and that its a lot of metal on the front surface.. However they are very accurate and smooth a glass. 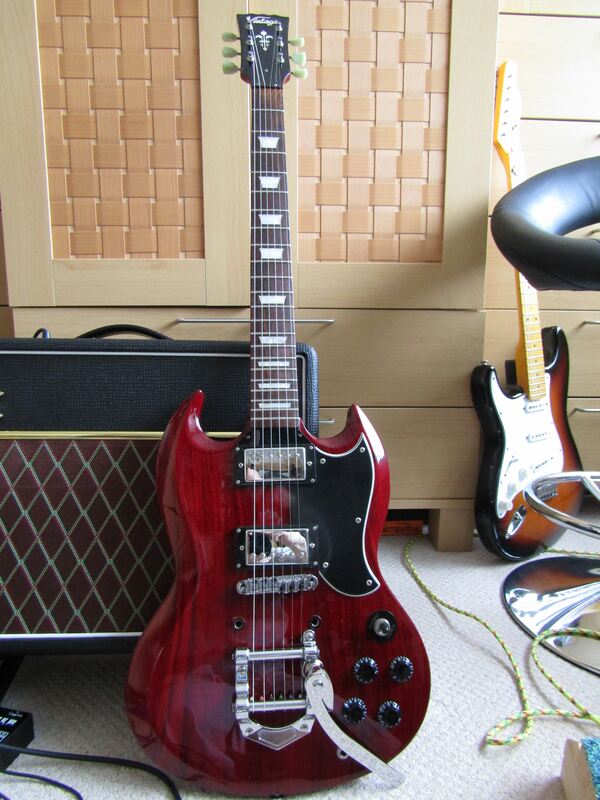 In addition the extra weight of the Stetsbar helped reduce the neck dive on my Epiphone SG.. 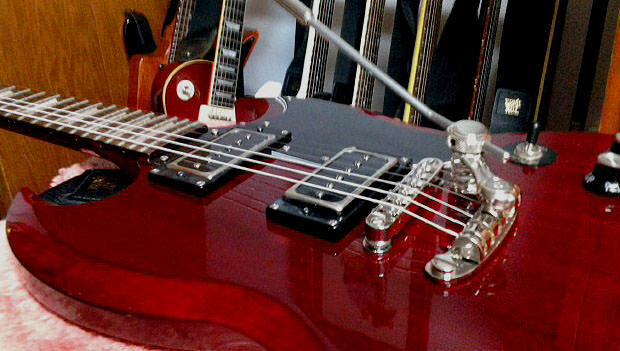 I try to avoid locking nuts as they usually work the best with fine tuners on the bridge/tremolo. Just for the heck of it, I stuck a rosewood bridge on my Wildkat over the weekend and was absolutely blown away by how much louder and brighter the guitar sounds vs. the tune-o-matic. I thought I'd get a darker, more muted sound with the wood bridge, but it's just the opposite. And it works fine with the tremolo. I suspect that over time, heavy use of the trem could cause the wound strings to start sawing away at the slots on the saddle, but I'm a very light trem user- just so touching the arm for color to my notes. Interesting experiment. Have you used something to keep the bridge from moving, like double-backed tape? Doesn't seem to be a problem, but again, I'm a pretty light player- no heavy rhythm or dive bombing the trem.